KELLY Mouthpieces is proud to produce signature tuba mouthpieces for Lee Stofer, tuba expert and professional repair technician. Like most players, I have searched throughout my career for "tools of the trade" that help me achieve the best tone, articulation, and intonation available. To that end, my mouthpieces are produced by KELLY Mouthpieces in Fond du Lac, WI, USA! Our Stofer-Geib design, with a 7mm narrow rim, 33mm moderately large cup opening, and 34mm moderately deep bowl-shape, has a sound quality not found in any other mouthpiece. The rim is well-rounded, but there is enough inner "bite" to make attacks clean and secure. Says Lee, "I find that I can play with a more relaxed embouchure, warm-up quicker and have better pitch accuracy, as well as getting that deep core sound I have always strived for. Many top orchestral players say that this mouthpiece has a unique sound, possessing a fundamental bass sound that others do not. This mouthpiece is now used by players of all levels, from high school students to a significant number of top orchestral musicians. Join the growing number of people that have discovered a mouthpiece that can help them go to the next level!" 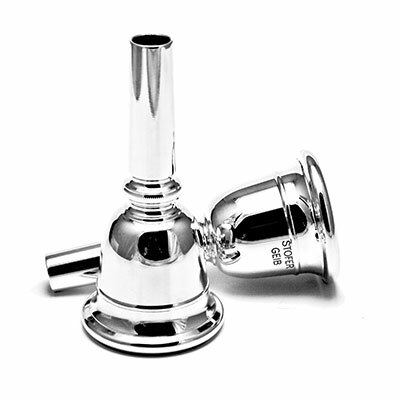 Silver-Plated Stofer-Geib Signature Tuba Mouthpieces! Available in American-shank & European-shank!